Mugen re-create the action. after the previous Successful change the appearance of the Honda Vezel, now turn to the low-sedan Honda City is exposed to the touch. Various additional accessories worn on the body of the Honda City. 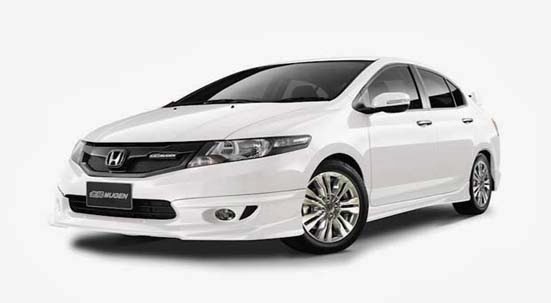 Is the Honda Cars Philippines, Inc. which has been doing along with Mugen. Honda City was used as a limited edition it says they are super exclusive, because it is only provided as much as 20 units. 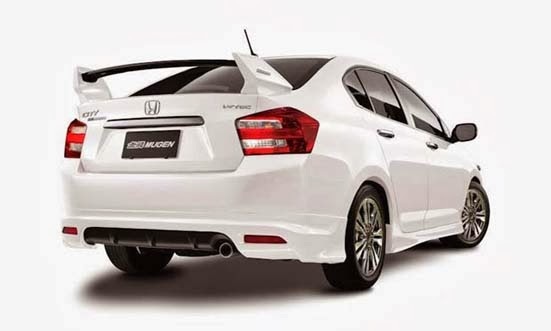 All New Honda City will be painted in colors Taffeta White, and will be offered in 1.5 EL AT variant type. Honda said that the concept behind City Mugen Edition is to create an Sport Active Superlative with streaming line design and nimble handling. Front grille exposed to touch Mugen so it now looks more sporty, also lower front spoiler, side and rear. Even, a special behind, there is a large wing spoiler striking, distinctive street racing cars. While the engine, still using i-Vtec engine capacity of 1.5 liters which has power 120 hp, mated to a 5 speed automatic transmission.